A Q&A with Rafeena Bacchus, M.D. Most of the time, your primary care physician is your first contact for health care. When you make an appointment, knowing how to prepare and what to expect will help you get the most out of your visit. Q: What kind of appointments can I get at MPCP? A problem visit addresses a new problem or revisits an old one. A physical examination is a preventative visit to review your history, examine your body from head to toe, check appropriate blood work (like blood sugar and cholesterol), administer age-appropriate immunizations, and offer age-appropriate screening referrals (like mammograms and colonoscopies). Making the right kind of appointment will ensure that your doctor can effectively address your health needs. Q: Can I do anything to get ready for my appointment? Be very clear about what you need when you make your appointment. This allows your doctor to properly prepare for your visit. For example, if you have abdominal pain, your provider can offer you a drape so you can undress from the waist down for an exam. Know what referrals you need. Take a few minutes to write down notes and questions to make sure all of your concerns get addressed. If your provider asked you to monitor your blood sugar or blood pressure, remember to bring those logs in with you. If you want to discuss tests ordered by a provider outside of MPCP, don’t assume that we have received these records, even if you asked for them to be sent. Track them down and bring them with you. If you need help tracking down records, call your provider’s assistant a day or two prior to your appointment to alert MPCP to this request. Asking for copies of test results when you are seen elsewhere is always a good idea. It facilitates your bringing them to your provider for discussion and helps eliminate duplicate testing. Feel free to ask for the records and test results – they belong to you. Q: When should I arrive for my MPCP appointment? A: Come 10-15 minutes early to complete paperwork, use the bathroom and gather your thoughts. Turn off your cellphone. This will ensure your entire appointment is used for face-to-face time with your doctor. A: Appointment lengths vary from 10 minutes for simple problems to 30 minutes for physical examinations or complex problems. While your provider would like to be able to address every concern you have, this may not be possible due to time limits. You may need more than one visit or visit type to address all of your concerns. Q: Sometimes my visit is delayed. Why is that? A. The most common reasons your doctor might be running late for your appointment are patient tardiness, complicated problems and emergencies. Feel free to ask the check-in staff if your provider is running on time. Q. What does my doctor need to know about my medications? A: Your doctor will need to know 1) what medications you take, 2) why you take them, 3) the dose for each one, and 4) how often you take them. We encourage all patients to create a list of all medications, supplements, and vitamins you take. Include any drugs a specialist or urgent care center added to your regimen. Some patients bring the actual pill bottles to avoid confusion. Your doctor can print a list at checkout of all the active medications we are aware of you taking. Once your provider has a full picture of what you take, they can help you avoid drug-drug interactions or be alert to medication-induced illness. Q. Is it okay to ask questions? A. It’s your doctor’s job to make sure you understand and follow through on care, so don’t be afraid to ask questions. If you don’t understand what your doctor tells you, say so. Repeat back what you hear to confirm you have it right. Take notes. If you still aren’t clear after you leave the appointment, call back and ask for clarification. Q: What health records should I keep? Take notes at your office visits to help you remember important points about your care, and keep them in your folder so you can review them when necessary. Bring your folder on any visit to a healthcare provider, an urgent care center or hospital to help reduce gaps in your care. Q: What happens after my appointment? A: MPCP uses its online Patient Portal to communicate test results, or you doctor may call you. But if you don’t get test results in a timely fashion, be sure to ask for them. Take prescribed medication as directed, and talk to your provider if you have side effects and need to make adjustments. If your doctor schedules a follow-up appointment, be sure to keep it so your doctor can check on your progress and make any needed changes to your care. 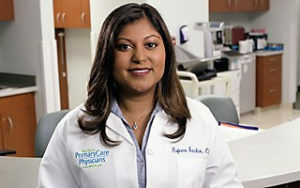 Dr. Rafeena Bacchus sees patients at MPCP’s Columbia office. She received her medical degree from SUNY at the Buffalo School of Medicine and completed her residency program in Internal Medicine at the University of Maryland. She is certified by the American Board of Internal Medicine.